OULU, FINLAND – Valossa™, a leader in artificial intelligence (AI)-based video recognition technology, today announced that it will demonstrate Valossa Search, deep video search capabilities included in its online Valossa Portal™ service, at IBC 2017 in Amsterdam, from September 15-19. Valossa will also unveil its redesigned Valossa Portal at IBC 2017, which will enable customers to gain understanding of their video content and make it easily searchable using Valossa Search. With the enhanced search capability, Valossa Search can enable rapid retrieval of clips showing, for example, actors portraying specific facial expressions in different audiovisual settings, women wearing dresses, or find appearances of celebrities or world leaders around specific spoken context topics. Valossa Search is able to more accurately identify scenes, topics, or actors by combining all semantic information in an audiovisual data stream into a natural discovery experience. In essence, Valossa AI is a platform that understands video like a human does, analyzing everything that is said, seen and heard in a video using a powerful analysis engine. A search example, “Find me clips with portraits of sad Audrey Hepburn and Cary Grant in a room,” illustrates how Valossa Search integrates a natural search experience into customers’ video assets. The use cases for the Valossa AI technology can be found in various parts of the video processing workflow; production, post-production, video asset management, and archiving can be improved by augmenting it with deep content analysis. Valossa enables completely new digital experiences for the consumers of video-based services. The Valossa Portal offers the industry’s first complete AI video recognition platform as a service, designed for professional broadcast and digital distribution. Valossa has completed several pilots with its AI-based video search feature, including Yle, the National Broadcasting Company of Finland. Valossa expects the deep search technology, which was originally created for entertainment search and demonstrated at www.whatismymovie.com, to become standardized throughout the industry, as on-demand services seek greater monetization around content using intelligent search features. Valossa Core API™, which was recently released, is capable of analyzing any video stream to create the most comprehensive understanding of video to this day – going beyond the capabilities of traditional image and video recognition systems. At the heart of the Valossa Core API runs the Valossa Core™ recognition engine, which is capable of detecting and identifying people, visual and audio context, spoken topics, named entities, general themes, shot boundaries, and explicit content. Valossa Core™ engine is available as a cloud-based API (Valossa Core API) or on-premise solution (Valossa Core API Software™). Valossa Core API produces scene level, time-coded metadata that describes everything relevant about each second of a video. The intelligent metadata enables a completely new generation of analytics, content management tools as well as new methods of monetizing video in digital video services. Valossa AI technology is commercially available as an on-premises solution or software-as-a-service (SaaS) through the Valossa Portal, at portal.valossa.com. The cloud-based Valossa Portal includes lightweight user tools to execute and manage analysis tasks, as well as to inspect, validate and discover video data with the AI-based content analysis results. Valossa Reports™ are content visualizations that provide detailed insights and overviews into video content at a level that greatly exceeds the capability of reasonable human effort to create it. By signing up to the portal, customers have possibility to participate to Valossa Search beta program. Valossa AI offers users a much richer set of analytics, expanding the contextual semantics of video data for what is the most holistic, multi-modal video analysis solution commercially available today. Based on prime research and essential patents from one of the world’s leading computer vision and AI labs at the University of Oulu in northern Finland, the Valossa AI technology can reach down into video content, identify it and enable a new generation of applications for asset management, analytics, contextual advertising, and digital media experiences. Valossa’s product portfolio also includes a descriptive deep search engine that enables natural, verbose and flexible querying for voice-controlled movie services and entertainment platforms. Valossa employs a wide range of pattern recognition, computer vision, machine learning, information retrieval and natural language processing (NLP) techniques to extract deep content metadata from video, including frame sequence and audio sample analysis and keyword extraction from speech transcripts and metadata. 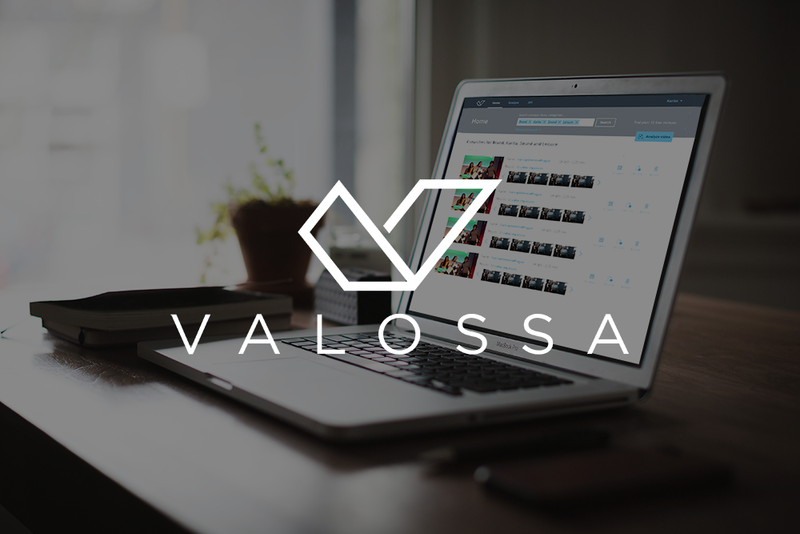 Valossa’s approach delivers holistic video content descriptions at the scene level as well as descriptive keyword annotation for video overviews. Valossa, the deep content company, is a leading provider of advanced solutions for AI-based visual content search and recognition. The Valossa technology represents years of prime research and essential patents from the University of Oulu in northern Finland. Valossa is headquartered in Oulu, and has representation in New York for the US markets. For more information, please visit the web site at www.valossa.com.